Since moving, I have been trying to take on one project at a time while furnishing our home. 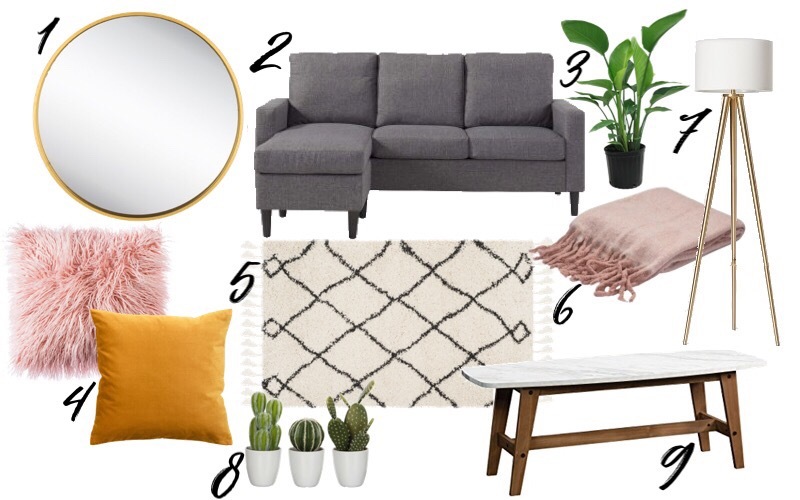 I have been obsessed with looking at the home decor in stores and online checking for things I might like to add to our place. Pinterest has been my main go-to for inspiration and decor/style ideas. I'm not sure if I have mentioned it but I feel that so far the kitchen and bathroom are the two rooms that I consider to be done. I'm not sure yet when I plan on sharing them on my blog, but I was thinking of possibly doing a what's in my bathroom kind of post and share the products I keep in there. I've been seeing a lot of that over on Youtube and thought that would be a fun post to share. What do you think? Or maybe doing that after the bathroom tour post... Let me know! Anywho, the next room I want to try and tackle is the living room. That room is full of potential I can't wait to get in there and start decorating and putting things together. This room is one that I have had a clear vision of what I want it to look like. Since I haven't begun furnishing the room because Rudy and I have been so busy with life, I thought it would be fun to share an idea of what I have planned for it. 1. One of that main thing I want to add to the living room is a large round gold mirror. Target carries the most perfect one for a good price and I've been eyeing it for months! I can already see this mirror going perfectly overtop of our fireplace! 2. There were so many different couches I had my eye on. I despise sectional couches, but when I came across this couch I loved how simple the style was. The main thing I loved about this specific couch is that it's a reversible sectional and can switch the chaise from left or right. It's a retro mid-century style and I love that it comes in grey because it's our color of choice for a couch. 3. Greenery! I want to fill the entire place with a bunch of plants! One specifically is these bird of paradise plant. I would like to have a mixture of different heights; tall and short plants. These are beautiful and continue to grow plus I've heard these are easy to keep alive. 4. Using pillows as accessories are one of my favorite ways to style a room. I do this all the time in my bedroom and now to be able to expand to the living room will be fun. I've been between using my blush fluffy pillows in this room or my newest mustard velvet pillows. I will have to see how the end result will look before making any decisions. Maybe I'll even use both haha. 5. I'm not a fan of rugs or carpet whatsoever but I think by adding one to this space will make it feel a bit cozier. This is probably one of the last additions I would introduce to the room to really decide whether it would be something I'd like to have. Just the idea of having a light colored rug would pair perfectly with our grey wood floors. 6. No matter what the weather may be I enjoy having some sort of throw blanket next to me. It's probably a comfort thing. I already have the perfect blush blanket that would look very nice thrown over the arm of the couch messily. The contrast between the pink and the couch would look great. 7. Adding this stunning gold lamp would probably be more as a decor piece. We may end up using it as a soft light while watching a late night movie, definitely more of a late evening or night time use. Our living room already has a lot of ceiling lights. The pop of gold and cream will make a lovely statement and it's too stunning not to include. 8. I adore cactus and succulents not just because they're very low maintenance plants but because they come in different shapes, sizes, and colors. They're perfect plants to use as small decor pieces like on a coffee table or stand. A cute simple accessory piece that also adds a lot of texture to the area. 9. This is one piece of furniture I keep going back and forth on, a coffee table. I haven't completely decided on what kind I would like to have but I have really been leaning towards this marble top coffee table. I feel the marbled surface would be a great contrast to the rest of the decor. There is so much more that I will eventually include such as coffee table books, candles, lots of fresh florals, and framed photos. I want to keep it fresh, clean, airy, and somewhat simple. 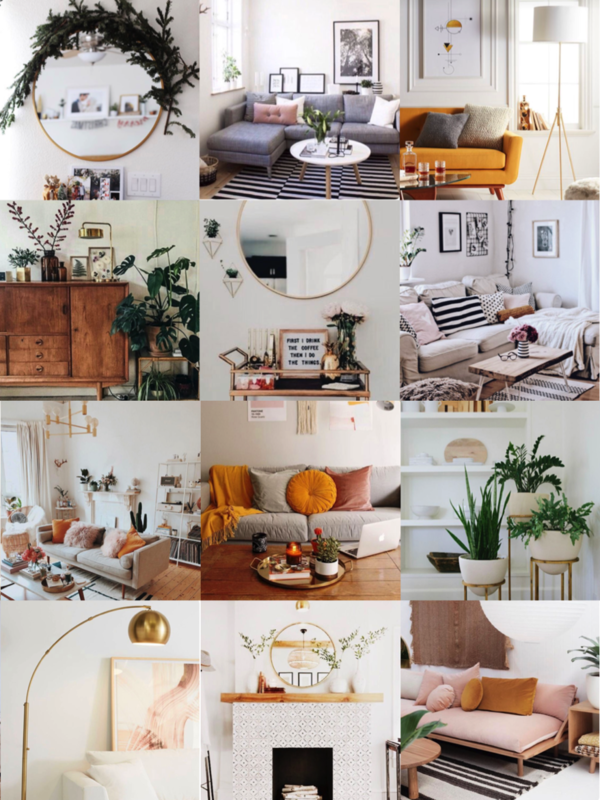 Below, I included some photos that have given me major inspiration for styling a few pieces in the living room. All photos were found on Pinterest! What are your thoughts on my inspiration board? Do you have any style tips or suggestions for me? I love the style you are going for it's so cute. I've also been picking up a lot of fresh plants to spread throughtout my house and some stores sell some fake but very realistic ones. That way you don't have to worry too much if you don't have the greenest thumb. I love the home inspo! The pink blanket, and the couch are so cute. I love the blush blanket. It's so simple yet it makes a statement. Girl who isnt eyeing that gold mirror from target its so dreamy! I swear I was ready to buy it for my room but I already have that huge vintage gold mirror, which I love. You're going to love those large lamps, its such a gorgeous lamp. Can't wait to see more of your home decor. Thank you! Target has so many beautiful home pieces, it's like candy land for the home haha.